"Sunu band is a sonar smartband that improves navigation for the visually impaired. Sunu band combines sonar or echolocation with gentle precise vibrations to inform the user about objects or obstacles within their environment. The band, emits a high-frequency sound wave that bounces off of objects that the user encounters. The resulting vibratory pattern changes depending on how close or far away the object is to the user. Sunu band augments awareness of the user’s personal space, reduces unwanted accidents and ultimately improves confidence while providing a more fluid and enjoyable mobility. Users of Sunu Band wear it in conjunction with the cane or guide dog to augment awareness and complement mobility by detecting obstacles to the body and head in way that's discreet and unobtrusive." Feel your environment with vibrations. Avoid accidents to your upper body. The Smartlux® Digital is a revolutionary, portable video magnifier that has a multitude of features and easy to use interface. The large 5" LCD TFT display provides 5x, 7x, 9x, or 12x magnification (even less when used in hand-held mode) along with 5 different viewing modes that include full color, black on white, white on black, black on yellow, and yellow on black. Illumination is provided by 2 hi-tech SMD LEDs and the tactile control buttons are easy to understand and use. Images can be captured and up to 20 can be stored. The Smartlux® Digital features a generous depth of focus and includes a stand that, when placed in its fully extended position, is ideal for reading. When placed in its half-extended position, it is ideal for writing. The two small SMD-LEDs on the underside of the device can be switched off when viewing other backlit displays, such as cell phones, to avoid screen glare. The screen has a high resolution of 800 x 480 pixels, is hard-coated for scratch protection, and is made with an additional anti-glare layer of film. Simple control buttons are symbolically marked and there are only 3 to learn: On/Off, Magnification setting, and the Contrast Mode. There is an automatic shut-off feature that will activate between 2 and 5 minutes of non use to save battery time. The Smartlux® Digital is ideal for anyone who is visually impaired and wants an economical, portable video magnifier! OrCam MyReader is an intuitive wearable device with a smart camera designed to assist people who are blind or visually impaired to read text, signs, menus and many of the other printed objects in everyday life. For more information, call the Edith Bishel Center 509-735-0699 to schedule a free hands-on demonstration. The Edith Bishel Center is a certified OrCam reseller for the following Washington counties ONLY: Benton, Franklin, Walla Walla, Columbia, Yakima, and Klickitat. If you are from outside of these counties, please give us a call and we will be happy to connect you with a reseller near you. The price of the Orcam includes 2-3 hours of required training. OrCam MyEye 1.5 has a database of millions of product bar-codes and stores up to 150 of your favorite products – such as supermarket items, drugstore necessities and credit cards - instantly communicating them through your own voice tag, enabling an independent shopping experience. With a new Full HD 3-in-1 camera the Acrobat HD ultra long arm provides the best image quality available today! 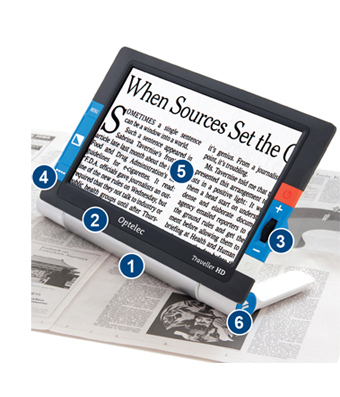 Enjoy brighter sharper colors and bold contrast with this feature rich electronic magnifier. A wider field of view allows you to see even more of what you want. Merlin ultra – Full HD Video Magnifier 22" & 24"
The new affordable Merlin ultra offers full high-definition color and contrast, resulting in sharp crystal-clear images and vibrant color accuracy. Merlin ultra’s new Full HD camera allows for a wide field of view, displaying more text on the screen in amazing detail. Simply the greatest value and best picture quality available in HD desktop magnification, there’s even more to see with Merlin ultra!